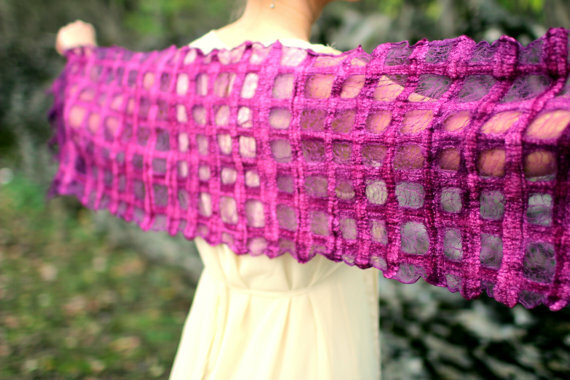 Nuno Felted Lattice Scarf: Bold, Feminine & Raspberry! – LIVING FELT Blog! Nuno Felted Lattice Scarf: Bold, Feminine & Raspberry! Accent your next outing with this hand dyed nuno felted scarf/shawl, felted by Kate Koprowski. What a lovely accessory for a Spring day or evening, we love rich the color combined with the lattice pattern for a light-weight yet luxurious feeling. Next Fun Felted Cards & Gifts to Give and Treasure! Gorgeous color & design. Haven’t tried scarf yet but working up to it! Thanks for the inspiration.